At a recent TCEA Google Educator Level 1 Boot Camp session, someone asked, “We have a teacher who is leaving and wants to make a backup copy of everything she has in Google Apps for Education Drive to her personal Gmail/Google Drive account. How can we help her do this?” Having successfully done this with my own data in multiple situations, I thought I would share my top three go-to tools for getting the job done. 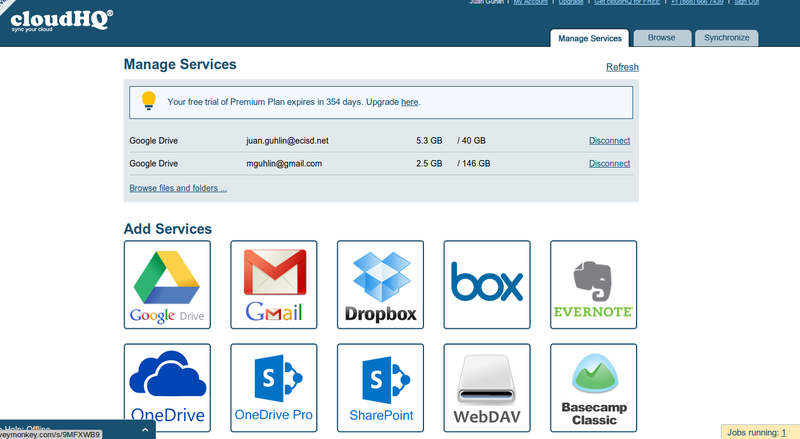 Multcloud.com, a free solution that supports multiple cloud storage solutions including Google Apps and Google Drive. A classroom teacher or staff member is leaving the school district and needs to make a backup of data from her work account to her personal account. A staff member has spent considerable time developing and archiving resources on her personal Google Drive and she now wants to copy it en masse to her district Google Drive account. A graduating high school student with a district-issued Google Apps account needs to quickly move his/her Google Drive data to a personal Google Drive account, Dropbox, or OneDrive account. You have archived video on your Google Drive and you want to migrate it to another Google Apps account. You want to transition someone from Evernote, a note-taking service, to Google Drive. A staff member is leaving and someone else is taking on the responsibility of maintaining documents. Use CloudHQ.net. It does a great job of copying/moving content from Google Apps for Education or Gmail to a private/public Gmail account and vice versa. It can also move Dropbox to Google Drive or any supported cloud storage or vice versa. You can sync content back and forth between a variety of services, which makes it a pretty neat deal at $9.90 per month (if you need that level of redundancy). CloudHQ.net also offers the opportunity to have a 15-day free trial, which works well for staff who are leaving and may just need a one-time task. However, you can obtain additional days of usage by referring CloudHQ.net to friends and colleagues. Another benefit is that you can set ownership for documents that are transitioned to a new location. Try MultCloud.com. 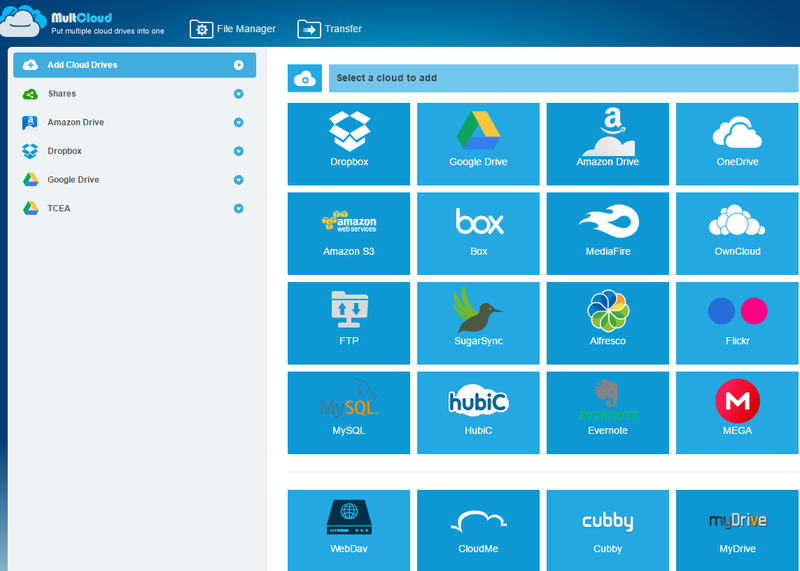 Using MultCloud.net, you are able to “transfer, migrate, backup, sync, move, integrate, manage many cloud drives such as Google Drive, Dropbox, OneDrive, Box, MEGA, SugarSync, Amazon Cloud Drive, Amazon S3 as well as FTP, WebDav, etc. And, transfer files across different cloud drives, such as transfer data from Dropbox to Google Drive.” MultCloud.net has also created a Chrome add-on that you can use to easily move/copy content. Earlier this week, after introducing Multcloud to teachers in a school district, they immediately began using it to backup their GoogleApps for Education information from GoogleDrive to their personal Gmail/Drive account! Explore Google TakeOut. Rather than directly copy files from one Google Drive to another (e.g. school/organization Google Apps to a personal Google Drive), you can save a complete copy of your Google Drive to your computer. I would only use this option if you are NOT sharing documents with collaborators, collecting information via Google Forms, and have Google Docs/Sheets/Slides that are embedded in web pages online. Making backups of critical data is important. These tools make accomplishing that easy! They are also a great way to enable students or staff to backup their data from one cloud storage solution (e.g. Google Suites for Education) to another (e.g. Microsoft OneDrive, Dropbox, personal Google Drive account). How can I save my google drive from my school (which I am leaving)? I can not transfer ownership. Another teacher used a thumb drive to save her docs. Any ideas how to do it? This will save all your files in Google Drive as compressed, zipped files that will be split in multiple chunks. Unzip the files on your computer, then copy them to your USB flash drive. Remember, if you have confidential or sensitive data, be sure to encrypt those files before putting them on your USB flash drive (in fact, avoid hanging on to ANY confidential or sensitive data if leaving your District). 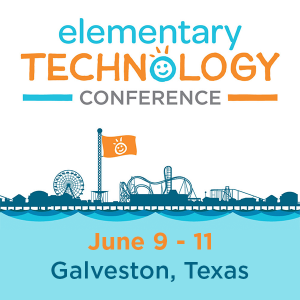 If you need a walkthrough, give TCEA PD Team a call at 800-282-8232.